This is provided as an example of inserting simple links and media in a WordPress post or page. As easy as a button click! 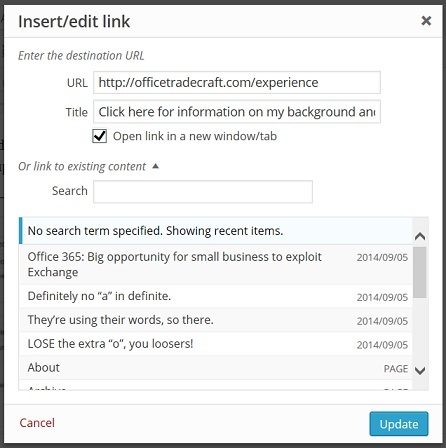 Here’s the “paperclip” menu to Insert/Edit an embedded link for OfficeTradecraft.com/Experience. The destination URL is what appears in the address bar of your Internet browser. URL is a Uniform Resource Locator designating the one and only unique file that provides that particular content. Tip: Go to the web page you want to share and Copy that site’s address then Paste it into the menu. The Title is the popup text that may appear as a prompt for users depending on how they are viewing your page/post. As for you loosers, there is a simple rule: lose the extra ‘o’.